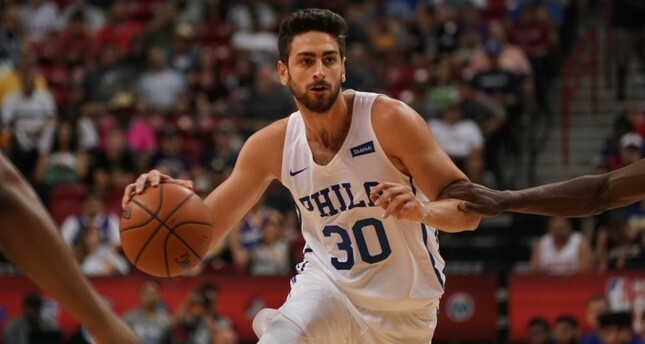 Turkish national basketball player Furkan Korkmaz scored 40 points in the NBA Summer League game in the U.S. city of Las Vegas early Saturday. The National Basketball Association (NBA)'s Summer League has started with players giving their best to make their team's rosters. Philadelphia 76ers' Furkan Korkmaz, in a game in which his team was beaten by Boston Celtics 95-89, scored a game-high of 40 points with 8/14 shooting from the 3-point line. He was 10 for 18 from the field and 12 for 15 from the foul line. Korkmaz became the fifth player to ever score 40 or more points in a summer league match. He also pulled down six rebounds, dished out two assists and made a steal. Korkmaz recently played for Turkish national team too; he scored 23 points in Turkey's routing of Sweden 77-52 to advance to World Cup qualifiers' second round group stage. Another Turkish young star, Cleveland Cavaliers' Cedi Osman, also took the floor when his team played against the Washington Wizards. Osman, in Cavs' 72-59 win, scored 15 points and pulled down 10 rebounds to make a double-double. He also made four steals, dished out three assists and blocked a shot.